100% Natural & good quality Almonds from the house of Tulsi. Tulsi Mamra lazeez are the most popular nuts sourced from the Iran. Mamra are rich source of Proteins, Minerals & Vitamins. Recommended For Children & Women at the Time of Pregnancy. Hygienically packed, No artificial ingredients. Help brain function & longevity. Tulsi Badam Giri Mamra Lazeez is famous for their health benefits and unique taste. Tulsi Mamra lazeez are the most popular nuts sourced from the Iran. They are rich Source of Proteins, Minerals & Vitamins. Good source of fiber, which helps, keep the digestive system operating normally and prevents constipation. These nuts are high in protein, fiber, healthy monounsaturated fats, potassium, and magnesium. Best as a serving for anytime snack. These nuts are extremely nutrient-rich and contain protein, copper, niacin, magnesium, fiber, vitamin E and selenium. 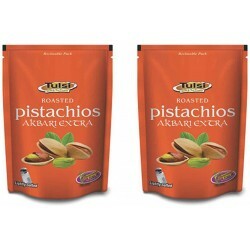 Tulsi Brand is premium nuts and dry fruits. Tulsi has pioneered a new and yummy way to consume the daily dose of healthy nuts and dry fruits. At Tulsi, we bring the taste and health together in a single pack in the finest of packing. We believe in serving the best products to our customers and hence we travel across the world to procure the finest nuts and dry fruits. Our products are processed and packed in FSSC: 22000 & HACCP certified plant – The best among food safety ratings and certified by ‘FSSAI‘.